The color inkjet printer market is running on optimism these days. Dell, Kodak, and Lexmark have all quit the business in the past year. Consumers are posting online more, printing less--and losing their patience with pricey ink cartridges. 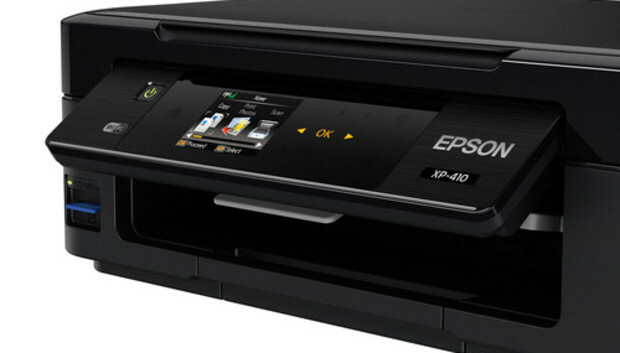 The $99 Epson Expression Home XP-410 Small-in-One does not solve any of these issues--and its inks are, in fact, quite pricey--but it does offer surprisingly good output quality along with basic multifunction features. Also, while it may seem counterintuitive, if you don't print much, the cost of the ink matters less. (Just be honest with yourself about this, or you'll regret it later.) So for those who truly are printing less, the XP-410 could be a good standby machine. What you get for the price is a compact, simply designed machine with a flatbed letter/A4 scanner on top and a 100-sheet rear vertical feed. Paper exits into a front output area. All these pieces use somewhat flimsy, rattly plastics, as is typical for products at this price point. The scanner lid does not telescope to accommodate thicker material, so scanning a book would be awkward. The tiltable control panel is better than what you'll see on most low-cost printers. There's a 2.5-inch color display and touch controls that are also context-sensitive (they light up only when needed). Other than the impulse we all have now to touch the display instead of a button, the control panel works great and is both intuitive and responsive. Connectivity is also good for the price. USB and Wi-Fi 802.11b/g/n are available for connecting directly to a PC or a wireless network. Front slots take SD or MS Duo media cards. Mobile printing is covered with Apple AirPrint and Google Cloud Print compatibility, plus apps for e-mailing or printing directly from mobile devices. One annoyance is the exile of the primary user guide and the Mac OS X drivers to Epson's Web site. The installation CD has plenty of room; why not just put them there? It's a puzzler, but common on Epson's lower-cost machines. Epson's gently pink color palette works to the benefit of most images. We noticed banding in one of our test color photos, but all other photos were very good. Even photos printed on our plain paper were pretty nice: a little grainy, but with decent brightness and accuracy. Even a color copy on plain paper was gorgeous. The XP-410 also produces surprisingly good text in all manner of fonts. The edges look classically inkjet-soft, but not fuzzy. Your results will vary, of course, depending upon the quality of the paper you use. We use Hammermill LaserPrint as our "plain" paper and the vendor's own stock for photos. Print speed is decent. Documents consisting of plain, black text and small monochrome graphics printed at an aggregate 6.6 pages per minute (ppm) on the PC and 6.4 on the Mac. Color photos took considerably longer--especially the full-page photo we print on the Mac, which took three minutes to print at best settings. On the PC, a smaller 3-by-5-inch photo took 16 seconds at default settings on plain paper, and 70 seconds at the Photo setting on Epson's own special stock. Scan times were among the slowest we've seen in a few years (as they were for this product's predecessor, so this is a feature, not a bug), but the scans themselves were good. Here's where you have to take care: The XP-410's ink is very expensive. The 500-page, $30 XL black works out to 6 cents per page (cpp), while the $17, 450-page cyan, magenta, and yellow XL cartridges are 3.8 cpp each. That's an above-average 17.4 cents for a four-color page. In the smaller standard capacities, black is a whopping 7.4 cpp, and each color 5.4 cpp. Spending 23.6 cents for a four-color page is pricey even in the entry-level category. Here's how ink prices work: The cheaper the printer, the pricier the ink. So if you print a lot, spend extra up-front for the higher-end printer and you'll be amazed at how affordable ink can be. If you print infrequently, however, a lower-cost printer with higher-cost inks won't matter--you won't use the inks enough to notice. It's for low-volume home and student users that the Epson Expression Home XP-410 Small-in-One is best suited. The bonus treat is surprisingly good output quality for the price.